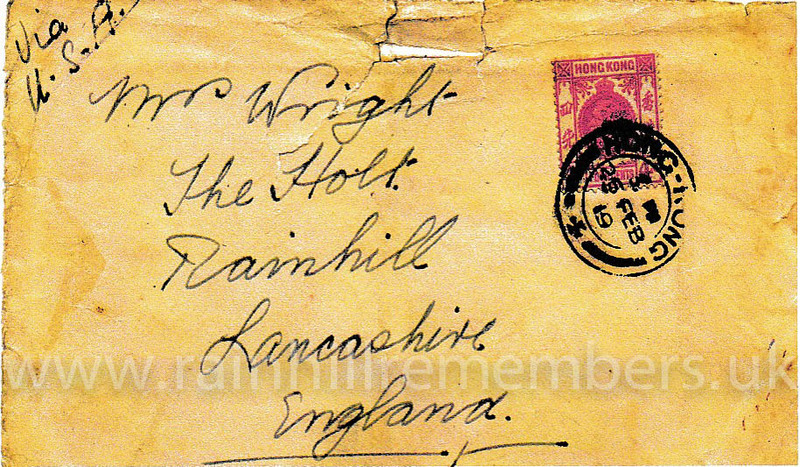 Reginald Wright was born on 15th July 1892 and lived with his parents Edmund and Margaret Jane (nee Crompton). 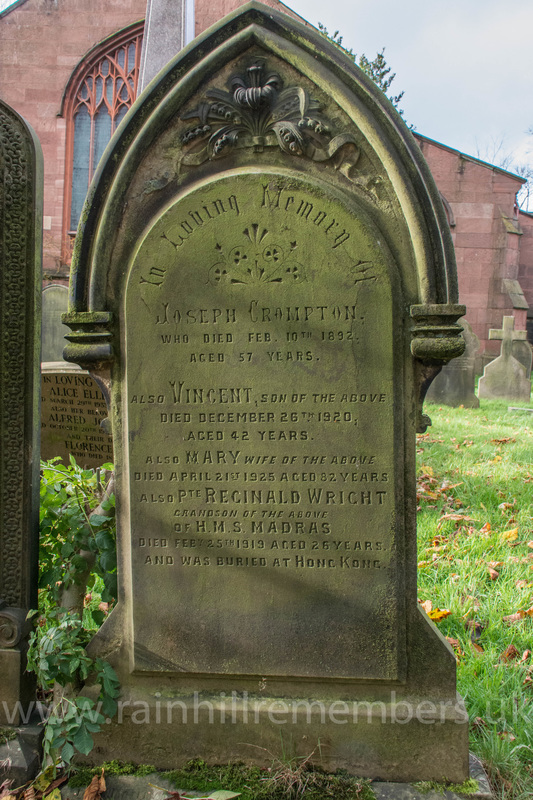 He was brought up at 3, Turnpike Road (Warrington Road) in the Holt area of Rainhill. He had four siblings, Cecil, Frederic, Marion and Mary Gwendoline. In the 1911 Census, he is listed as working as a Chemist’s Apprentice. 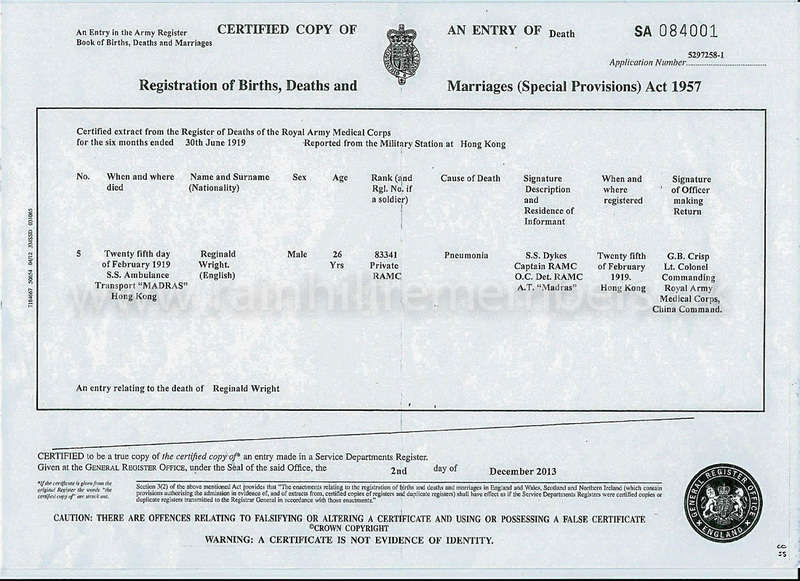 It is not clear if he had any medical background, but he was conscripted into the Royal Army Medical Corps as Private 83341. Although the inscriptions on his grandparents headstone in St Ann’s says that he served on HMS Madras this is not the case. He did in fact carry out his duties on the Hospital Ship the HS Madras. 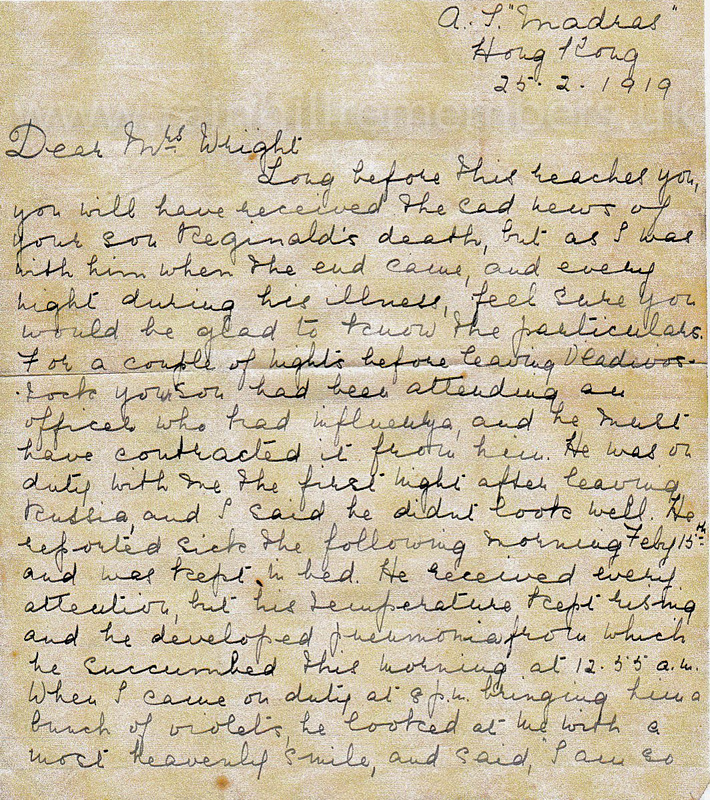 Sadly Reginald died of pneumonia, aged 26, aboard the ship on 25th February 1919. 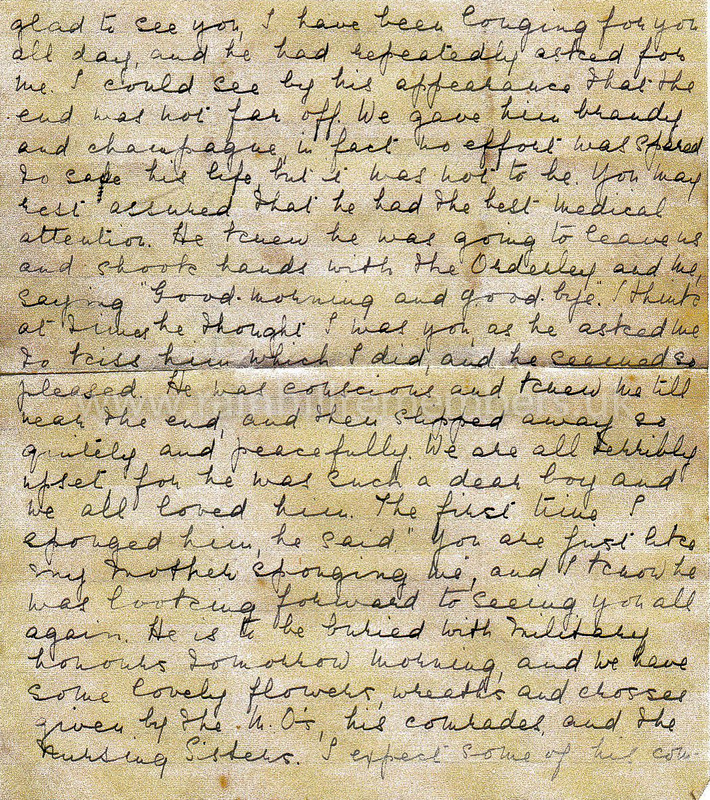 Dykes, the Ship’s Captain was the informant and Lt. 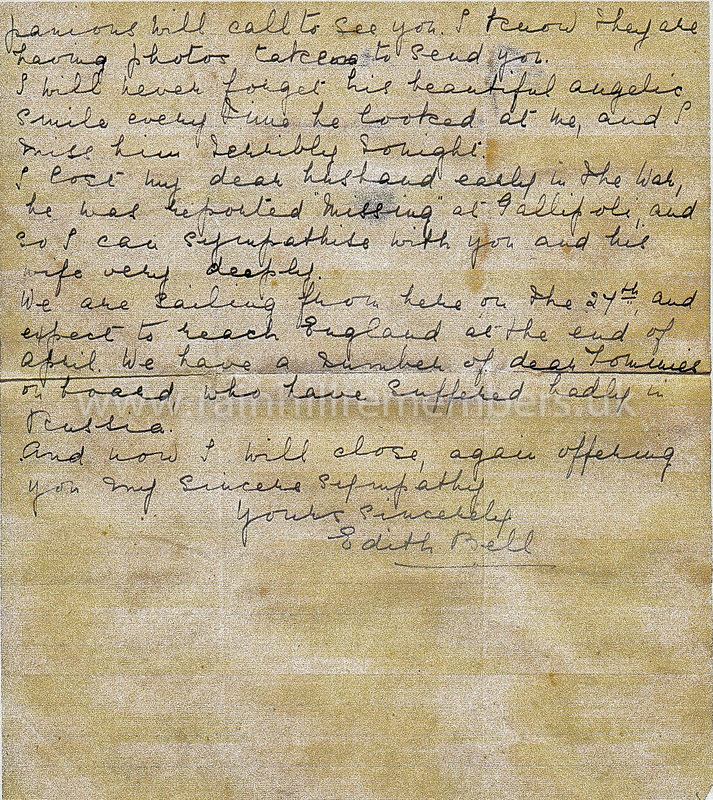 Colonel G.B Crisp signed the return. He is buried in the incongruously named Happy Valley Cemetery in Hong Kong. An inscription on his headstone reads “erected by his comrades”. 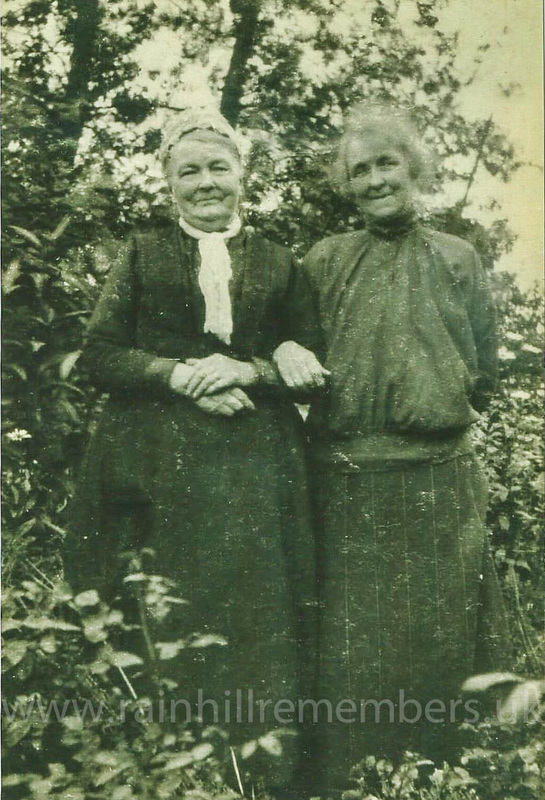 The Madras had to plough her way through a sea of ice 10 to 12 inches thick from Vladivostok which was then in the hands of the Bolsheviks with 300 English (Tommy) patients, many of whom had been prisoners of war. At the end of the war the Madras was converted back into service as a passenger/cargo vessel and it was carrying out these duties on a voyage via Columbo to Bombay on 14th July 1944 when she was torpedoed off Mungalore. She was hit amidships and water gushed in through a gaping hole. Of the 117 crew, 12 gunners and 27 passengers, 18 crew members and one passenger were lost, of the others most were rescued by H.M.I.S Bihar and landed at Columbo. 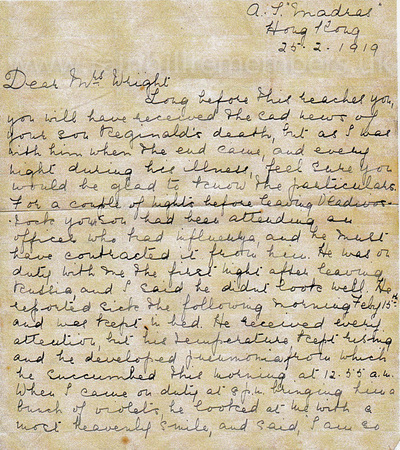 During our research a niece of Reginald’s, Mary Margarite Reynolds (nee Wright) was located in Auckland, New Zealand and forwarded a letter written by the nurse, Edith Bell, who looked after him and was with him at his death on board the HS Madras. 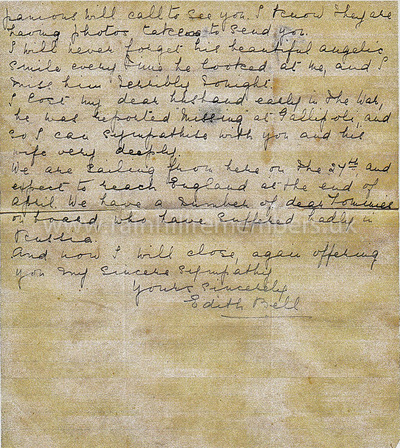 Edith had lost her husband, Charles Adam Bell at Gallipoli and he was buried at Lone Pine Cemetery. 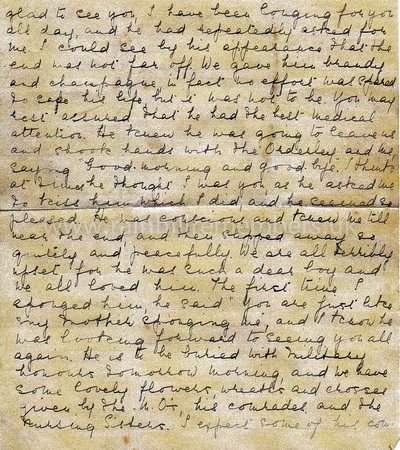 The letter and envelope sent by Edith Bell to Reginald's mother (see below). At a special ceremony at the Warrington Road Cenotaph on Sunday 3rd July 2016, Rainhill village dedicated a new plaque bearing the names of 17 men with Rainhill connections who perished during WW1. 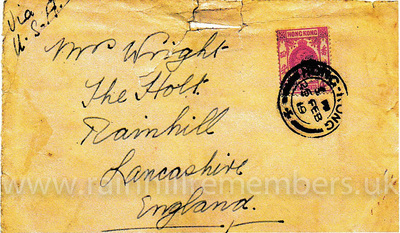 These men's histories were found during Rainhill Civic Society's research. Rainhill Parish Council funded the plaque and organised the ceremony with Rainhill Civic Society, our local Churches and the Royal British Legion. 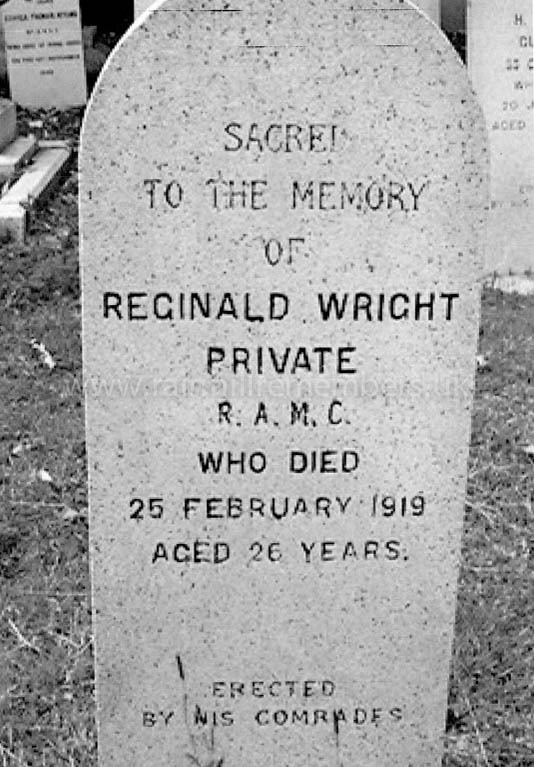 Reginald Wright is one of those names.